When Do You Decorate for Holidays? When do you guys decorate for holidays? And when is too early to post Fall projects and crafts? Being bloggers our reality is always skewed. In the past we always put up our Fall decorations after the first of September… usually during Labor Day weekend. We’re completely obsessed with Fall décor so we don’t mind putting in early September. We sometimes might wait on the front porch decorations, but that’s only so the neighbors don’t think we’re crazy (especially when it’s still 100 degrees outside). Although the past couple of years it seems like we’ve been putting things up a little earlier, maybe mid August? But that’s usually because we want to get ideas and projects to you guys early in Fall so you can steal some of the ideas for your own homes. I think a big reason we love to decorate for Fall is because we keep up most of the same décor from September to late November. We’re not really fans of decorating for Halloween, but we do add a couple small things to our Fall décor to switch it over to Thanksgiving (gotta love those turkeys!). The day after Thanksgiving we switch over everything to Christmas and normally keep it up until the first week of January. By that point we’re usually ready to get the house back in order. I mean if you think about it, we have holiday decorations up from roughly September 1 to January 1. That’s 4 months out of the year! Crazy. When do you guys decorate for Fall? Would you guys like to start seeing Fall projects, or prefer to wait? Does it even matter to you guys? 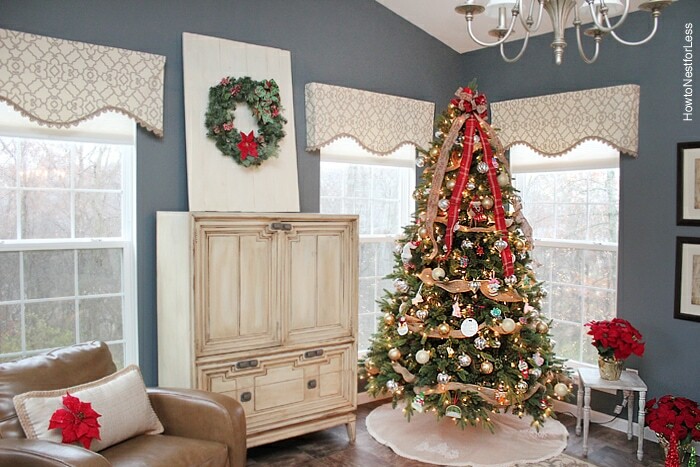 Would you rather see DIY house projects or holiday decorating stuff? We’d love some feedback from you guys! In August I transition things to Apples & Sunflowers (used to do a back to school theme count down, but my daughter has out grown that “fun” haha), then in September I am putting out full Fall decor w/ Football mixed in. The 1st week of October has us in full Halloween decor mode —inside & out!! November 1 it all switches back to Fall, Cozy & Turkeys. December 1 is when Christmas comes out & then the 1st week in January I transition to the Winter decor — snow flakes & snowmen and it’s an icy blue & creme color scheme. I think about 4 weeks before the season/holiday is a good time to post ideas, projects & recipes as that gives you time to think, plan & buy. Krista, thanks! I was looking everywhere for a schedule. This is perfect. Now I need to do some purchasing and organizing! Do you have any “go-to” online stores where you like to buy your decor? Well I’m always a huge fan of Amazon… especially with 2 day prime shipping! Did you see my 20 fall pillow covers for under $10? I’d also check out Joss & Main and Kirklands! Starting to think about fall decor and would love to see some ideas. If I don’t start early, the season will be over before I get around to it !! I don’t decorate for Fall until the first week of OCTOBER – it’s just too hot here in Florida and most people don’t do any. Fall October and November then Christmas the month of December. OH, you’re right!! Didn’t even think about living in hot climates! Thank you so much for the real and thought out comment, Darcie! And I love your decorating strategy. I like to have some generic items as well and then sprinkle in extra items for specific holidays. Some of the pumpkins in my house for fall are actually jack o’laterns that I flip around for Halloween, and then flip them again for Thanksgiving! I’m trying to move back to my roots more and back to recreating items on a budget. Ben didn’t go back to work after his last hospital stay so we’re a one income family. We’re wanting to focus again on real renovations and crafts for real families! 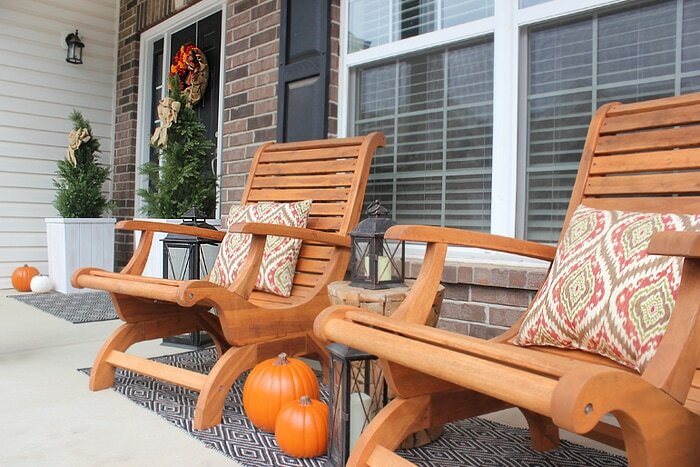 Not everyone can afford the big ticket items, but we all want a beautiful, cozy home! I say ‘D’ all the above. I enjoy fall as soon as I can get hubby on board!!! I live in Albuquerque and is is hot hot hot…. so my sunflowers and pumpkins help trick my mind that is getting cooler. I try hard to wait until sept 1 (but that gets fudged often). I love to craft and seeing your blog, often gets me inspired to make something new each year. Haha, I’m the same way! I want to get all the Fall decor out now, especially since it’s been in the 80s this past week! We start to decorate Labor Day Weekend too. I layer the months. September has the first layer of colors and leaves. October adds Halloween, Nov. 1 Halloween comes down the turkeys, pilgrims, and Native Americans are displayed. We decorate the Friday and weekend after Thanksgiving for Christmas. Sometimes, I will put one of the trees up before Thanksgiving. Sounds pretty close to our decorating schedule!! As a retired teacher, I’m used to decorating at the beginning of each month for the holidays. I’m dying right now because August is difficult with school starting today. But it’s a little early for football decor. Plus, since we moved to a patio home, I’ve really downsized my decorations. I’ve been on the lookout for a back to school garden flag. I don’t see many back to school decorations anymore… maybe because everyone goes straight from Labor Day to Fall nowadays. I remember when I was young my mom used to have a mini tree in our foyer that she would decorate for each season, and I always loved her back to school tree! Mini chalkboards, apples, little crayons and markers… I always loved that tree! I just love decorating for seasons and holidays! Any ideas that you put up will be appreciated. Fall is my favorite season of the year, so I like decorating in early September, but don’t always go the full orange, pumpkins, leaves, etc. until near the end of the month. I like to leave it up until Thanksgiving and then decorate for Christmas. 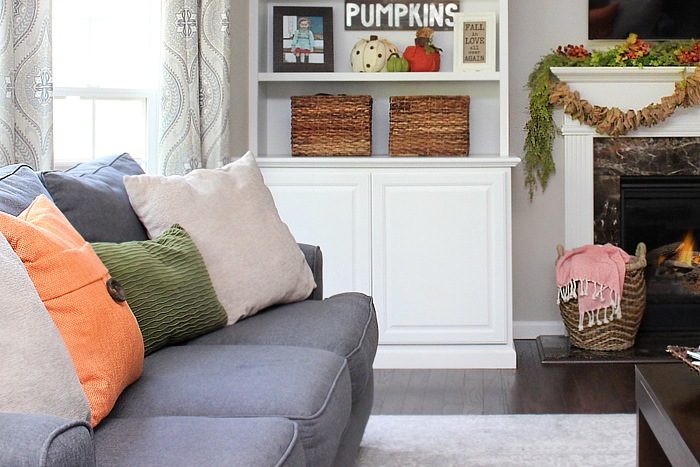 So, I always love seeing fall ideas early…..
My favorite season of the year, too! I do apples and some Fall later part of August. Ist of Sept put out Fall decorations. Last wk of Sept Halloween or Happy Harvest ideas. Last week in Oct put out Thanksgiving decorations. Last week of Nov after Thanksgiving put up Christmas. I need to get more apples into my fall decor! I usually do sunflowers in August, falling leaves in September, Halloween in October, Harvest/Thanksgiving in November, and Christmas NEVER goes up before December 1st. (Middle child’s birthday is November 30 — it already gets swallowed up with Thanksgiving, no need to drown it in Christmas too!) January brings snowmen but several of the Christmas decorations include snowmen so these 2 months overlap. I honestly like to wait until September for Fall stuff…I’m not ready to ditch Summer even though it’s 100 degrees out. I don’t want to work on Fall stuff yet either. I’d rather see DIY or other posts until September. Then bring on Fall! 100 degrees… ew! We’re lucky that it’s been low 80s this past week. Hoping it stays that way so I don’t feel too bad if I do start decorating 😉 And you are lucky because we at least have our laundry room makeover coming next week. More DIY for ya!! I decorate for fall the first of October & take it down right after Thanksgiving. I rarely start fall decor before the last week of September. I always wait til sometime between the first day of fall and the end of September, probably because in So California it’s usually still in the 90’s & 100’s in September. I start with apples & sunflowers, pumpkins & grouds, colorful leaves of red, gold, orange etc. Then mid October, Halloween. Then I replace Halloween decor with Thanksgiving turkeys and pilgrims etc. I start Christmas decor thanksgiving weekend and take it down around New Years. I like to put out my fall stuff as close to after labor day as possible, because the day after Thanksgiving we like to decorate for Christmas and winter. I know people complain that that is too early for Fall and that you should wait until the actual start of the season but I think that is way too late. I wouldn’t keep my spring decor out until almost the end of June, so why am I going to keep summer decor out after the nights start getting chillier and all the kids are back at school?